General Motors introduced the 4L60E transmission half way thru model year 1993 in Chevrolet and GMC full size trucks. This transmission was converted out of the 700R-4 transmission which has been around since 1983. The Hydramatic 4L60E transmission is a computer controlled 4 speed automatic transmission with torque converter clutch, and can be found behind a 4 cyl. engine up to a V8 engine, 2 wheel and 4 wheel drive versions. The 4L65E is the same as 4L60E transmission however it has 5 gear pinion planetaries and is heavier duty unit. Currently the 4L60E transmission can be found in any and all GM full size truck platforms, S-series trucks, Hummer, Isuzu pick ups, G-Vans, rear wheel drive cars such as Corvette, Camaro, Firebird, older Impalas, basically any rear wheel drive GM car or truck with under 8600 GVW. Complaint: Truck has no reverse suddenly, seems to shift late. Cause: possible that the sun gear shell has broken or stripped splines inside, this will result in no reverse and no 2nd and 4th. will shift 1-3 very late or when foot taken off gas. sometimes you can still have 2nd and 4th as the sun shell will hang up on broken splines. also can be low reverse clutches wiped out, try manual low at 10-20 mph and should feel like brakes are on, engine braking, if just coast away then the low reverse clutches are not holding. Complaint: Truck wont go into reverse or slips in reverse badly, all forward gears are fine.. Cause: two things make this transmission back up: one the reverse input clutches, can be wiped out due to bushing wear and ring damage on stator, second is low reverse clutches wiped out. you can determine which with simple test: drive forward and shift up to say 2nd or 3rd gear, not above 20mph max! take foot off accelerator and pull shifter into manual low, truck should pull into low gear and have engine braking, or feel like brake are on. If has low gear but just "coasts" away down the road then the low reverse clutches are the culprit. ( using downhill grade works best for this test.) If truck does have engine braking then your reverse problem is the reverse input clutches/drum. Complaint: Transmission shifts are soft, slipping, shudders some or all gears. before or after an overhaul. Cause: Check the mass air flow sensor, can be faulty and or overoiled aftermarket air filter is causing MAF to be dirty and erratic etc. Test you can perform: disconnect the MAF sensor and drive truck, if shifts good/hard then likely the MAF sensor is your troubles. Complaint: Truck wont move in OD/3rd but will when shifter moved to manual 2nd or low. Cause: The input sprague has failed, moving shifter to manual 2nd/low makes the overun clutches take over and truck moves. Also can be wiped out forward clutch pack. Complaint: 1996 model year trucks only, slipping/burnt clutches, repeat failures. Cause: 1996 was first year for new combined vehicle control module and GM had problem with an internal ground between the circuit boards in the VCM. This can cause erratic pressure rise and repeated transmission failure due to burnt clutches, especially the 3/4 clutch pack. The fix is to externally repair the ground problem with a GM service repair kit, part number: 12167310. This problem will only exist in 1996 model year trucks. Complaint: Trouble code P1870 Transmission component slipping, Harsh shifts. Seems to shift late, shifts 1-3, has no 2nd or 4th gears. Cause: The 2/4 band is likely burnt, be sure to check flatness of drum surface when band has wiped out, the band also has selectable pin for clearance and very important that correct band pin is used, the only way to check this is with Kent Moore tool# J-33037. Sometimes the sun gear shell can be stripped out or broken which should cause no reverse as well but sometimes will still back up do to hanging up on splines in reverse. Complaint: Trouble code P0894 2001 and up trucks. Complaint: All shifts are hard, no trouble codes at all. Cause: Check charging system first, may be low voltage in truck, not enough amps to control EPC sol, may not set any codes. can also be faulty EPC, AFL valve problems, press. regulator valve stuck and or worn boost sleeve. check TPS operation on engine. can be wrong, stuck and so-on. Complaint: MLPS switch plugs wont come out, possible broken switch or connector upon removal (up to 2004 model years). Cause: Heat has melted the sealant between the plug and switch, you can usually safely remove the plugs if stuck by warming them up with Bic lighter or similar low heat source. pry gently with small screwdriver etc. if you crack the switch or plug ends you will need to replace them, the switch number is: 24229422 or 12450016 Allison part # 29540479 (all are same switch) and fits 4L60E, 4l80E and Allison 1k/2k units up thru 2004, the repair ends for the harnesses are available: large connector part number:15305887 and small connector part number:15305925 from any GM dealer. Cause: This means that the 3-4 clutches are burnt out to point that they cannot hold anymore. requires rebuild of transmission. Likely due to wear in stator bore, (worn bushings) pressure rise problems, overloading, overheating. There's a lot of aftermarket "fixes" for this, as long as you find the cause and assemble everything to specifications the original clutch set up will work fine and you don't need some elaborate shift kit. Try to keep clutch clearance to .030-.060, replace bushings and inspect bore where rings go, replace solid rings on input shaft, REPLACE EPC solenoid, especially the 04 and up solenoid , it is junk! and lastly do not remove the 5 pressure plate return springs in the 3-4 pack, if they are burnt to crisp and squashed then get new ones, (they keep clutches from dragging when coming off.) Check proper operation of Mass Air Flow sensor on later vehicles: this is how computer calculates transmission EPC pressure and is common to be bad, symptoms will be slipping shifts, flare on 2-3 shift which can be why your 3-4 clutches were burnt up in the first place. lock up clutch not working will cause serious overheating and burnt clutches as well. Complaint: No lock-up converter clutch working and no codes. Cause: This can simply be the brake pedal switch is sticking, misadjusted or bad, Brake pedal is input to tcm to shut off converter clutch so if tcm sees brake on will never allow lock-up to come on. you can see this in data on a scan tool. You may also have brake lights on so check rear of vehicle. 1-2 shift shudder or slip 2001 thru 2003 trucks. • Throttle position is less than 15 percent. • Engine coolant and transmission fluid are at full operating temperature. • The outside ambient temperature is warmer than 24°C (75°F). If the condition is present, disconnect the generator 4 cavity connector (2 wires in the connector) and retest. If the condition is no longer present, perform the correction listed below.If the condition remains unchanged, the condition will not be corrected with this procedure. Look for other causes of the condition. Install an external sense lead to the generator assembly. This is accomplished by adding a wire from the generator four wire connector to the generator output BAT terminal. Disconnect the negative battery cable from the battery/batteries. Slide the protective boot on the generator BAT terminal aside and remove the retainer and wire cable from the BAT terminal. Unplug the generator 4-cavity terminal from the top of the generator. Inspect cavity D on the generator connector for a red cavity plug. • If a red cavity plug is present, it is not necessary to replace the generator connector. Remove the CPA and save. Remove the red cavity plug and continue with step 9. • If a red cavity plug is NOT present, continue with the next step. Remove and save the orange weatherpack seal and CPA from the 4-way connector. Using the proper terminal removal tool, remove the two or three wires from the 4-way connector. • On vehicles without Supplemental Brake Assist (SBA), install a red cavity plug, P/N 12059168, into cavity "A" of the new 4-way connector, P/N 12186568. • On some 2003 model year vehicles with SBA, install the dark blue (Circuit 5668) wire of the vehicle wiring harness into cavity "A" of the new 4-way connector. Install the brown (Circuit 25) wire of the vehicle wiring harness into cavity "B" of the new 4-way connector. Install the gray (Circuit 23) wire of the vehicle wiring harness into cavity "C" of the new 4-way connector. Obtain a piece of 0.80 mm/18GA black wire, 254 mm (8 in) long. Install a red terminal seal, P/N 12048086, and terminal, P/N 12048074, (crimp and solder) on one end of the new black wire. Install the new black wire into cavity "D" of the new 4-way connector. Reinstall the connector seal and CPA, from the original connector, to the new connector. Plug the 4-way connector into the generator. Route the black wire to the generator BAT terminal, sliding the wire into the small end to the output terminal boot, along side the generator output wire. Crimp and solder the ring terminal, P/N 12103514, on the open end of the new black wire. Place the generator output wire and the new black wire onto the generator BAT terminal and install the retainer. Tighten to the BAT terminal retainer to 9 N·m (80 lb in). Tighten the battery cable retainer to 17 N·m (13 lb ft). Complaint: Light throttle harsh 1-2 shift or flare/bump 1-2, 2003 to 2007 trucks. General rebuilding tips for GM 4L60E transmissions. First and foremost on these transmissions is REPLACE the bushings in the unit. they wear badly and can cause all kinds of troubles, check the ring bores due to worn bushings. Get yourself the Kent Moore tool # J-33037 which checks band pin length. If you need to change band pin the longest one available is GM # 8680501 and can be ground down to adjust instead of buying several sizes. Do make sure the ground end is smooth and round like original before you install so doesn't dig band anchor thru. Replace broken springs in accumulators, lightly scotch brite the bores in case. Tip: the heavier the spring the firmer the shift will be. you can essentially block the 4th accumulator with a large spring such as a torqueflite 2nd acc spring and have a nice shift. We recommend replacing the TCC regulator valve and fixing bore on all units, as well as the AFL valve and bore. Sonnax has the valves and the tools to do this and will save tons of grief down the road! 3/4 clutch pack: replace the 5 return springs under the pressure plate if show wear such as shrunken, burnt etc, keep clearance to .030- .060, books show much more but can cause 2-3 shift flare and will burn up again. You can adjust clutch pack clearance with earlier thin steels, double up etc if you don't have different size pressure plates. Check planetary gear and pin wear, very common rear planetary pins are worn and gears "wobble" will blow up gear set when too loose. Check unit end play and try to maintain .020-.030 clearance with the shim under the input drum bearing. Always replace the sun gear shell even if it looks mint! these fatigue and break, strip spline etc and cause no reverse and no 2nd,4th. you don't need a heavy duty shell here. new stock one is fine, theres alot of heavy duty ones but the stock style will last just as long. Check all Torrington bearings, especially the trapped ones inside planetaries for roughness, cracks and so on. you can snap apart the loose ones and visually inspect as well. make sure you install the bearings in the correct way, very common and easy to install upside down and will cause catastrophic failures. 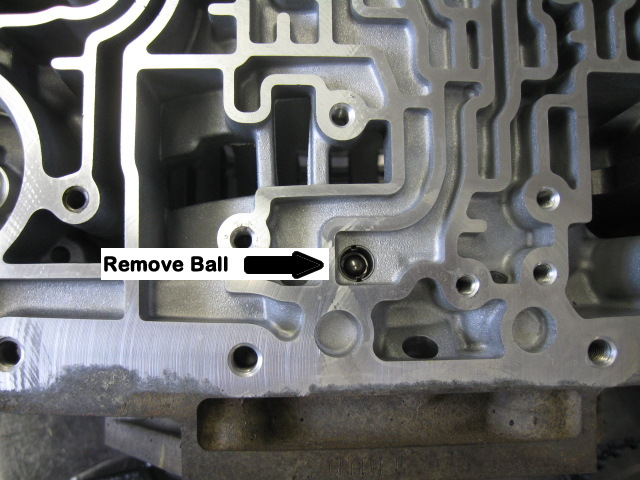 Replace input shaft seal rings and reverse seal rings with solid teflon seals. you need the tools and get them if you don't have them. 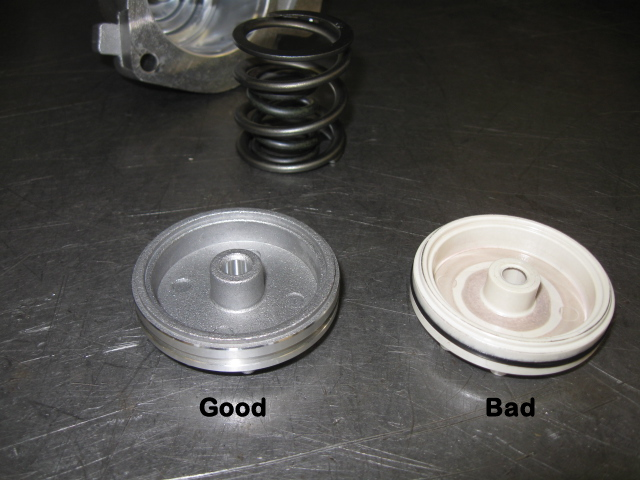 Always replace torque converter with quality reman. the low reverse clutch pack from dragging and burning up. Replace the EPC solenoid unless you can test with solenoid testing machine and adjust etc, we recommend always replacing the 2004 and up late solenoid as they don't adjust well and are known to be bad with miles on them etc. For shift quality upgrades click here.